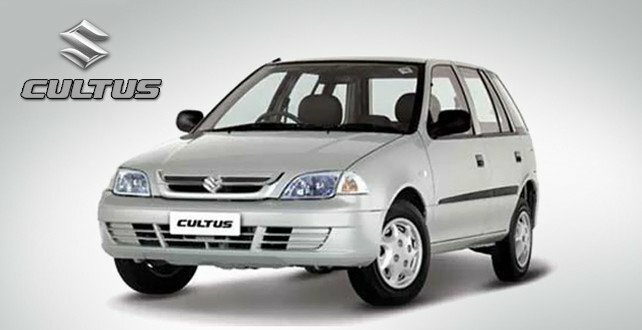 Suzuki Cultus a car known for its Executive looks was launched in Pakistan in 2000 by Pak Suzuki with 3 Cylinder 1000cc Carbureted Engine and 5 Gear Manual Transmission. The Car was very basic in its outlook and was launched with the three variant that was VX, VXR& VXL. Due to its sleek hatchback shape and economical price it became the Apple of the eye, or you can say it was the only hatchback at that time which had good space from inside while maintaining its sleek exterior. The Interior was luxury according to its price tag. The drive was comfortable. The rear Suspension was Independent which provides the smooth drive even on bumpy roads. In 2001 the Production of Factory Fitted CNG started so it became convenient to the buyers.. The VX variant of the Cultus had black bumpers with no air-conditioning while the VXR was equipped with Body matched color bumpers and with air-conditioning. The VXL Variant of the Cultus was Fully loaded that in addition to the VXR. The features that includes in VXL were POWER STEERING, POWER WINDOWS and BODY MATCHED SIDE MIRRORS. In 2005, Pak Suzuki discontinued the VX variant while the VXR & VXL remain produced. Although the vehicle had not any Safety feature like SRS Air Bags or ABS but still it was ruling the market very well. During the whole time period Cultus received some minor Cosmetic Changes that includes ALLOY RIMS, DOOR MOULDINGS, FRONT & REAR BUMPERS and HEAD & TAIL LIGHTS. The Interior Includes, the color changes in AC GRILLS, DASHBOARD FRONT PANEL COVER and a SPEEDOMETER. In 2007, Pak Suzuki brought a major change in the heart of Cultus and that was the EFI ENGINE. The Old 3 Cylinders carbureted engine was replaced with New 4 Cylinders EFI (Electronic Fuel Injection) Engine while the Transmission remains same. The EFI engine provides the better fuel average than the carbureted engine because the everything in EFI Engine works on the basis of Sensors & Actuators which controlled by ECU (Electronic Control Unit) while improving power and torque delivery as well.The available variants were now called as VXRi and VXLi. In 2010, Pak Suzuki Launched Suzuki Swift, but their own Cultus VXLi became the competitor to the new Swift so they had to discontinued the production of VXLi to boost up the Sales of newly launched Swift. In 2012, Pak Suzuki introduced Euro II technology. It is used to prevent harmful emissions from the vehicle and make the environment friendly. Vehicles with EURO Technology also known as Green Vehicles. In 2016, Pak Suzuki rolled out with the Limited Edition of Cultus. The Shape was same but still some cosmetic changes were made that included new door trims & fabric, 2-DIN sound system, matching door mirrors and alloy rims. The price of the final edition Cultus went up to PKR 11.24 lac for the Euro-II and PKR 11.99 for the Euro-II CNG variant. This Limited Edition of Cultus remains Continued for about 1 year. In Feb 2017, Pak Suzuki representatives mentioned in a press release about the discontinuation of bookings of Cultus. The Journey of 17 years of Cultus was about to end, and revived in a new mode altogether. After the discontinuation of Cultus, pictures of New Cultus already leaked and were roaming around the Internet. It became the hot topic for all Automotive Sites/Bloggers and Automotive Enthusiast. Many of them Praise the Car because they did not expect such type of modernized Car from SUZUKI. In April 2017, Pak Suzuki officially launched the NEW CULTUS with its new Dynamic and Sleek hatchback Shape and with wide luxurious interior.Internationally this car is known as Suzuki Celerio and in Pakistan people also expected the same name but it was launched with the name of CULTUS. The car has new 1000cc, 3 cylinder K-series EFI Engine and 5 gear manual Transmission front wheel drive. The shape was totally different from its old model. The car is also equipped with Key-less entry & Immobilizer (Anti-Theft Security System). Inthis ignition key is encoded for exclusive use with the immobilizer only; therefore, it is impossible to start the engine without the original encoded ignition key. The New Cultus is also equipped with Electronic Power Steering System, Power Windows, Powered Mirrors which can be adjust from driving side, Fog lamps, Chromed front grill, Alloy Rims, ABS (Anti-lock braking system) and best feature regarding Safety is SRS Dual Airbags, one for driver and other for the front passenger while this the only locally manufactured car by Pak Suzuki which is equipped with Airbags. Although this car has not came with factory fitted CNG. The new Cultus is currently available in 7 colors i.e Pearl Red, Graphite Gray, White, Super Pearl Black, Cerulean Blue, Silky Silver & Sand Beige.This New Cultus came up with two variants that is VXR & VXL. Cultus VXR is a base model that is very simple. VXL comes with Stylish Fog lamps while VXR does not have. VXL is equipped with Power Mirrors, while VXR is equipped with simple Mirrors. VXL has body color matched side mirrors and VXR has Black color side mirrors. VXL has power windows while VXR comes with manual handle through which you have to pull the mirror up or down with your own hand. VXL has modern ABS (Anti-Lock Braking System) which provides better grip while braking and prevent the vehicle to skit. And on the other hand VXR is has not ABS sytem. Cultus VXL has Alloy Rims while VXR has Steel Rims with Wheels Caps. Presence of Dual Air-Bags is the most important difference between both variants. Suzuki Cultus VXL comes with latest safety feature of SRS Dual Air Bag system but VXR does not have this feature. Dual Air-Bags means it has air bags not only for driver but also for passenger on front seat. Last and the most important difference between both variants of New Suzuki Cultus 2017 is the price. The basic variant of Cultus VXR comes in 1,250,000 PKR while New Cultus VXL which is fully powered variant comes in 1,391,000 PKR. Hence the difference between VXR and VXL is about 1,41,000 rupees. All the Authorized Dealers have started to provide free Test Drive of this New Cultus from23rd of April. On the same day the test drives started, many People Exchanged their old Suzuki Vehicle with the new Suzuki Cultus with Suzuki Exchange Program. Overall New Suzuki Cultus 2017 is perfect hatchback car that is added into the collection Pak Suzuki. Now everybody is waiting for the New Model of Suzuki Mehran and there is hope that it won’t be with just Cosmetic Changes!. Next articleElectric Cars – Do they have a future in Pakistan?